May the Fourth be with you friends! On May 4th we celebrate the biggest science fiction franchise to ever exist, and what better way to do that with the best Star Wars stories you can enjoy outside the films! Knights of the Old Republic is not only the best Star Wars games, its one of the best RPGs ever made. Providing diverse RPG combat and beautifully in-depth choice in conversations, the game is ludicrously accessible and allows for multiple playthroughs. However, the game’s graphics and controls have not aged very well and some people might have trouble looking past the muddy graphics. Then again, the game is on mobile too! The small touch screen allows for improved controls and smaller textures. Who its for: People looking for an authentic Star Wars experience. People who prefer story over gameplay will be at home in the Old Republic. Who its not for: People who want complex, fast paced action. Anyone who can’t put up with old 3D graphics. Following the adventures of legendary X-Wing Pilot Wedge Antilles, Rogue Squadron is arguably the best Star Wars book without any Jedi at the forefront of the story. It takes place at the start of the original trilogy, but does not have any of the original trilogies’ main characters. It focuses solely on Antilles creation and training of his legendary x-wing squadron. The story is full of action, clever plot twists and a great setup for the X-Wing series. Who its for: Lovers of action based novels and the Star Wars universe. Who its not for: People who want an easy read. If you’re looking for Star Wars politics or tons of Jedi action, you’ve come to the wrong place as there isn’t much here. Zayne Carrick is one of the worst Jedi knights ever. Thats how he starts out at least. The 50 Knights of the Old Republic comics following Carrick’s misadventures are some of the best comics i’ve ever read and I can never suggest them more to anyone who likes comics or Star Wars. You don’t even have to be a huge fan of Star Wars to enjoy these comics, as the art style is beautiful and easy on the eyes with a great, longlasting story. This story will make you love the old republic more than the original trilogy. Who its for: literally anyone who can appreciate a good comic book. Those who like stories about underdogs. Who its not for: Some people might find the art style’s avid use of heavy lining and dark colors exhausting. Where to find it: Ebay or your local comic book store! Thanks to Marvel, the comics are no longer in print or sale officially beyond the first 18 issues. If you want to find this comic, you’ll have to read it online at hellocomic.com or find it somewhere that sells the Dark Horse versions of the comics. The Clone Wars was two different shows about the same story, just different in length. Personally, I suggest the 2008 series as its longer (and canon). The 2008 series does a better job of focusing on the clones in the clone wars and making the identical soldiers unique. The clones truly seem unique in The Clone Wars, a fun oxymoron which makes the episodes centric on clones that much more interesting. Each clone in the story is very unique, despite being presented as identical. Although there is a problem with continuity in the story, with lessons taught in one story arc is suddenly forgotten in the next, each story arc acts like its own full star wars story worthy of any fan’s time. And then there are the Jar Jar episodes ugh. They’re far and few in between though. Who its for: People with plenty of time (each season is 22 episodes long!) who want to keep up with the Star Wars canon. Who its not for: people who have trouble with continuity, Jar Jar haters, and people who want to keep hating Anakin Skywalker (he’s genuinely interesting in the Clone Wars). Bonus: Star Wars Battlefront Free Trial! In celebration of May 4th, EA is giving everyone on origin a free 4 hour trial period to the whole of Star Wars battlefront along with 4444 in-game credits to anyone who logs in on the day of the event! Double Bonus! Get Star Wars Games For A Discount! GOG, Playstation, and Microsoft are offering big discounts on Star Wars games this week, check them out before the sales end! 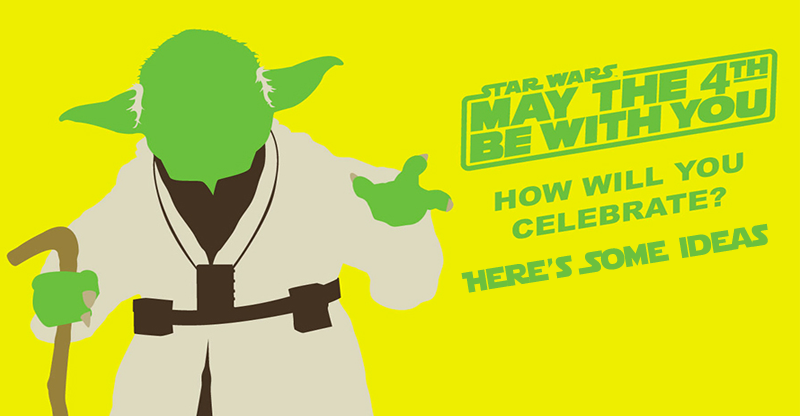 How are you celebrating May 4th this year? Leave your ideas in the comments below!